Beer-battered cauliflower served with our housemade remoulade. 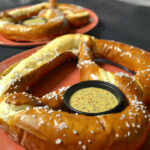 Authentic German pretzel served with a side of spicy mustard. Corn tortilla chips, slow-roasted all natural chicken, black bean salad, housemade spicy queso, fresh pico de gallo and green onions. 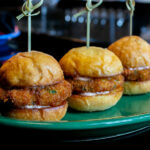 Golden-fried shrimp cakes with a housemade remoulade on a toasted slider bun (Three sliders). Freshly seasoned and seared tuna on top of a citrus soy Nappa cabbage slaw. Grilled pita bread with a spicy goat cheese spread topped with flame-grilled sliced steak. 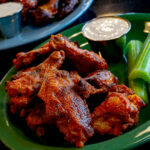 All natural wings, fried and tossed in your choice of Jerk sauce, Buffalo sauce, Beer BBQ sauce, or Old Bay dry rub. Served with celery and spicy ranch. Large shrimp dipped in beer-batter and coconut, and served with Thai chili sauce. Our housemade hummus comes with an assortment of carrots, celery, and toasted pita for dipping. Roasted Brussels sprouts with bacon and balsamic reduction. Flame-grilled beef on top of fresh mixed greens, lightly melted blue cheese crumbles, crisp applewood bacon, red onion rings, and spiced mushrooms on a toasted bun. 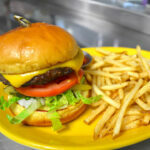 Flame-grilled beef with fresh lettuce, tomato, housemade pickles, burger sauce, diced onions, and cheddar cheese on a warm bun. 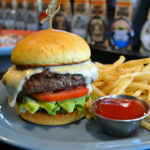 Seasoned and flame-grilled burger with lettuce, tomato, avocado slices, and our Face Plant® IPA queso. 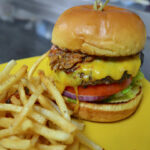 Grilled beef patty topped with BBQ pork, cheddar cheese, lettuce, tomato, and onions. A fresh grilled lamb patty topped with a feta-tzatziki sauce, lettuce, tomato, onions, and roasted red pepper. 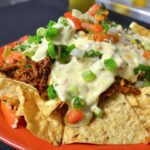 Slow-roasted carnitas, spicy lime aioli, and roasted corn poblano salsa. Three tacos served with black beans. Seared tuna with wasabi cream and ponzu slaw. Three tacos served with black beans. Blackened white fish with spicy lime aioli and fresh slaw. 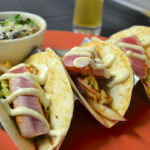 Three tacos served with black beans. Marinated carne asada, shredded lettuce, pico de gallo, cotija cheese. Three tacos served with black beans. Seasoned and grilled chicken breast on a bed of lettuce, tomato, onions, and Bavarian mustard, topped with melted provolone cheese, and crispy bacon on a warm toasted bun. Toasted garlic butter ciabatta with fresh mozzarella, seasoned tomatoes, basil leaves, and a balsamic reduction. Zucchini, yellow squash, mushroom, and mozzarella cheese on ciabatta and panini pressed. Slow-roasted pork shoulder, salami, housemade pickles, pepper jack cheese, and spicy mustard on a toasted bun. Grilled chicken breast marinated in a light sesame soy ginger sauce, served with rice and roasted vegetables. Tender flat iron steak marinated in our Face Plant® IPA, served with roasted vegetables. A rack of our eight-hour braised ribs, grilled and covered with our housemade barbecue sauce. Served with hand cut fries, coleslaw, and housemade pickles. Seasoned and grilled 6 oz. sirloin topped with bourbon butter, served with mashed potatoes. Pan-seared salmon finished with a Bavarian mustard cream sauce and served over mashed potatoes. 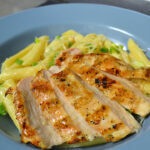 Sliced grilled chicken and our housemade Alfredo sauce over penne pasta, topped with Parmesan and green onions. 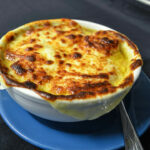 Beer-braised onions in a beef broth topped with house croûtons, and provolone cheese. 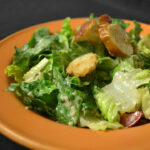 Romaine hearts, Caesar dressing, pretzel croûtons, cherry tomatoes, and Parmesan cheese. Lightly-seasoned grilled salmon, fresh spinach leaves tossed with hearts of palm, red onions, cucumbers, and cherry tomatoes, drizzled with a soy-ginger sesame dressing. Zesty chili made with Face Plant® IPA, local beef, black beans, and the right amount of heat. Served with tortilla chips. BBQ chicken with spring mix, black beans, roasted corn poblano salsa, tomatoes, red onions, avocado, cotija cheese, croûtons, served with a spicy ranch dressing. Tomatoes, cucumbers, red onions, and goat cheese with mixed greens. 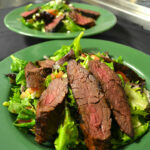 Served with our Rhino Chasers® Pilsner vinaigrette. Grilled chicken, mixed greens, toasted pine nuts, sliced strawberries, goat cheese, and tossed in a pale ale vinaigrette. Seasoned and grilled shrimp, romaine hearts, Caesar dressing, croûtons, cherry tomatoes, and Parmesan cheese. Warm brownie made with Lost Rhino Root Beer, topped with homemade vanilla ice cream, fresh whipped cream, and a caramel drizzle. Lost Rhino Root Beer with homemade vanilla ice cream.